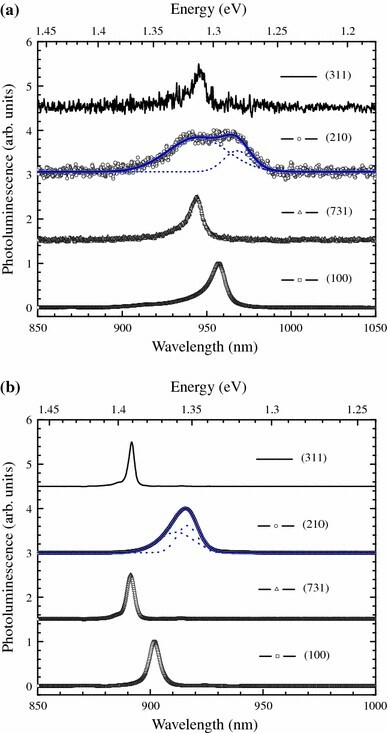 The morphological and optical properties of In0.2Ga0.8As/GaAs quantum wells grown on various substrates are investigated for possible application to superluminescent diodes. The In0.2Ga0.8As/GaAs quantum wells are grown by molecular beam epitaxy on GaAs (100), (210), (311), and (731) substrates. A broad photoluminescence emission peak (~950 nm) with a full width at half maximum (FWHM) of 48 nm is obtained from the sample grown on (210) substrate at room temperature, which is over four times wider than the quantum well simultaneously grown on (100) substrate. On the other hand, a very narrow photoluminescence spectrum is observed from the sample grown on (311) with FWHM = 7.8 nm. The results presented in this article demonstrate the potential of high-index GaAs substrates for superluminescent diode applications. Superluminescent diodes (SLDs) have been of great interest due to various applications, such as optical coherence tomography (OCT) and optical sensors [1, 2]. Significant research efforts have been focused upon increasing the spectral bandwidth as broadband SLDs are expected to improve depth resolutions for OCT systems [1–4]. A variety of approaches have been used to broaden the spectral bandwidth by engineering the device active regions through including quantum dots , multiple quantum wells (MQWs) , stacked twin active layers , asymmetric dual quantum wells , and quantum-well intermixing . Among the many attempts in broadening the spectral width, there have been surprisingly few, if any, efforts made on high-index substrates based SLDs. Due to the difference in growth kinetic, strain, charge or surface polarity, as well as band structures on high-index surfaces [8–12], semiconductor quantum structures on these surfaces have been showing interesting phenomena [13–16]. For example, lateral ordering of QDs and QD clusters have been observed on B-type high-index surfaces and (731) surface, respectively [17, 18]. Even though intensive research efforts and significant progresses have been made on the high-index GaAs surfaces, there is a lack of research on high-indexed substrate for superluminescent diodes. 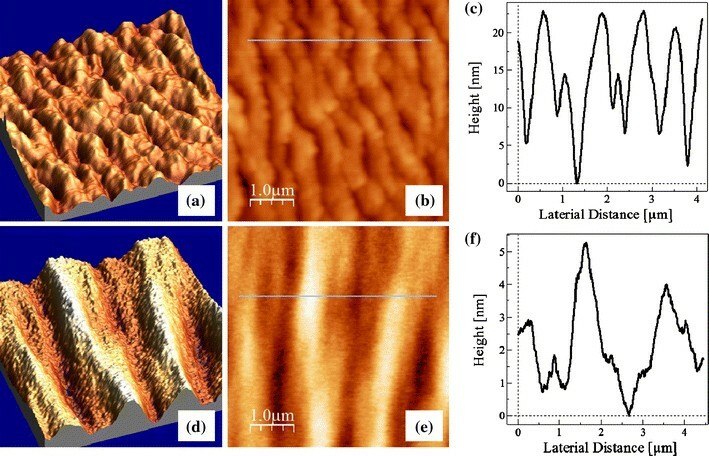 Accordingly, this work focuses on the effects of surface orientation on morphological and optical properties as well as explores the possibility of high-index surfaces for SLD applications. It has been well known that different substrate orientations have different growth reaction kinetics as well as various microscopic patterning of the surface . The latter property, natural roughness, presents on the high-index substrates influence the structure electronic properties and hence providing an additional means of emission spectrum broadening . Therefore, high-index surfaces may help advance the state of the art in SLDs in broadening emission spectrum. In this article, GaAs (100)-, (210)-, (311)-, and (731)-oriented substrates are used in this study. The In0.2Ga0.8As/GaAs quantum well structures under investigation are grown simultaneously on epi-ready GaAs substrates by a solid-source molecular beam epitaxy (MBE) 32P Riber system. In this work, four substrates (100), (210), (311), and (731) are chosen and mounted side by side on a same molybdenum block. An important point to mention here is that the growth conditions are optimized only for (100)-oriented substrate. After oxide desorption at 600°C, a GaAs buffer layer of 500 nm is grown at substrate temperature of 580°C. The GaAs growth rate is one monolayer (ML) per second. Sequentially, 400-nm GaAs was grown at 0.7 ML/s, followed by 50 nm Al0.3Ga0.7As layer. The active region consists of only one In0.2Ga0.8As quantum well of 7 nm grown at 520°C, sandwiched by 50 nm barriers of GaAs. Another 50-nm Al0.3Ga0.7As layer is grown following the growth of the GaAs barrier. In the end, the entire growth is finished by another layer of 50 nm GaAs, and an additional 7-nm In0.2Ga0.8As is deposited on the surface for morphology study. All samples are not doped to eliminate the doping effects on optical properties of different oriented planes. Morphology study is carried out by an atomic force microscopy (AFM). The optical properties of all samples are studied by photoluminescence (PL) technique from 77 to 295 K. The excitation wavelength and power is 532 nm and 50 mW, respectively. Illustrated in Fig. 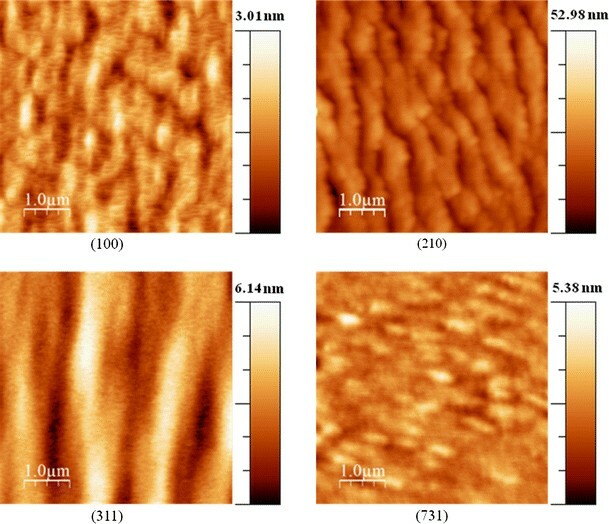 1 are the AFM images of the as-grown samples on different oriented GaAs surfaces. It is clear that the surface morphology is strongly dependent on the substrate orientation; the surfaces of (100) and (731) are relatively smooth while three-dimensional structures on (210) and (311) surfaces are well observable. The root mean squared (RMS) roughness for (100), (210), (311), and (731) is 0.40, 4.83, 1.14, and 0.50 nm, respectively. It is worth notice that the very RMS and terraced nanostructures with a large size and height distribution are obtained from (210)-oriented sample, as shown in Fig. 2a–2c. Although only equivalent thickness of 7 nm In0.2Ga0.8As is deposited, the height of these terraced nanostructures is as high as ~20 nm. In addition, wire-like nanostructures are also observed on GaAs (311) surface, which also exhibit a height distribution within a range of ~5 nm, as shown in Fig. 2d–2f. The significant difference in morphology may be explained by the difference in surface energy, surface strain field, and natural microscopic steps . As a result of such natural variation of surface construction using high-index surfaces, the quantum well energy states can be dispersed and will then lead to inhomogeneously broadened gain spectrum. In order to get an insight into the optical properties of different oriented samples, PL measurements are carried out at different temperatures. Normalized PL spectra at room temperature and 77 K for all four samples are shown in Fig. 3a, 3b. A large difference in spectra width has been observed for different oriented surfaces. The full width at half-maximum (FWHM) and peak shift of all samples are summarized in Table 1. For the QW on (100) substrate, the PL spectra have FWHMs of 11.6 and 5.4 nm at room temperature and at 77 K, respectively. Meanwhile, the PL spectra of QWs on (210), (311), and (731) surfaces demonstrate considerable difference, with FWHM of 48, 7.4, 9.8 nm at 295 K, and 14.5, 2.9, 4.1 nm at 77 K, respectively. At 295 K as well as 77 K, the sample grown on (210) surface shows the broadest PL spectrum, while the sample on (311) has the narrowest spectrum despite of the higher value of RMS than samples on (100)- and (731)-oriented substrate. As shown in Fig. 3a, the PL spectrum at room temperature of the sample on (210) can be fitted with two Gaussian curves, which may be attributed to transitions from excited states or two groups of size distribution. We believe that the peak at shorter wavelength is due to transitions from excited states. This assumption is supported by PL measurement performed at 77 K to as shown in Fig. 3b. The PL shows an asymmetric spectrum with a tail at shorter wavelength. At such low temperature and excitation, the presence of the tail is a strong evidence of size distribution of the terraced structures. In addition to the spectrum linewidth, a blueshift is observed for the (731)- and (311)-oriented samples and a slightly redshift for (210)-oriented sample. Simply, the PL shift may be attributed to surface roughness, which leads to different degree of confinement [21, 22]. For example, the surface roughness of (210)-oriented surface is even larger than the QW thickness, which, therefore, is expected to significantly affect the electronic bands. Moreover, the anisotropy of the heavy-hole bands, surface step density structure, etc. in the different GaAs-oriented surfaces may also account for the shift . In order to obtain additional information about optical properties on different surfaces, temperature-dependent PL measurements are performed. The FWHM from 77 K to 295 K for all samples are plotted in Fig. 4a. 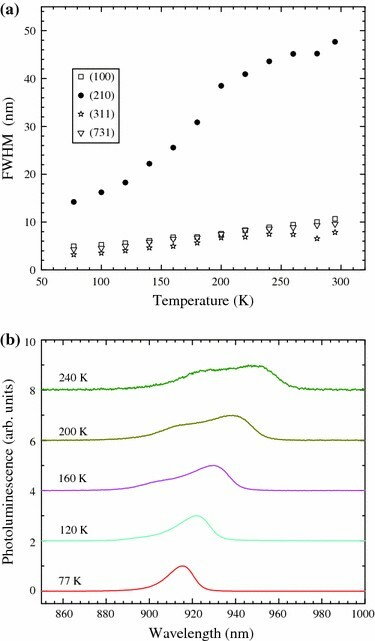 The temperature-dependent FWHM of (210) surface shows a significant difference from the results of other surfaces. First, the linewidth of (210) surface is much larger than the linewidth of other surfaces. Second, a non-linear FWHM increase profile as a function of temperature has been seen for the (210) surface, while FWHM of all the left three surfaces demonstrates a monotonic broadening because of electron–phonon scattering. 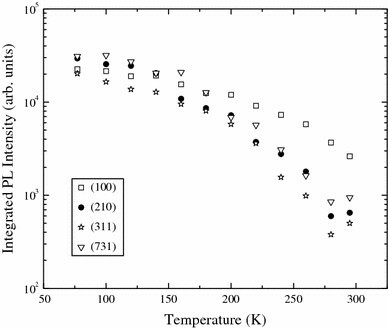 The PL spectra of (210)-oriented surface at different temperatures are plotted in Fig. 4b. Before the tail evolves into a second peak (<160 K), the broadening is mainly from the peak at long wavelength. However, due to the appearance of a second peak at short wavelength, the FWHM of (210) shows a very rapid increase from 160 to 240 K. Besides, the broadening of the PL spectra for (210) surface has a steeper slope than other surfaces at both low and high temperatures. This could be explained by the broad size distribution of the nanoterraces on (210) serving as another broadening factor in addition to the intrinsic electron–phonon scattering. Finally, temperature-dependent integrated PL intensity for all surfaces is plotted in Fig. 5. For all orientations, the integrated PL intensity presents a similar decrease behavior, and, however, an unusual rapid decrease is observed for non-(100) orientations as temperature approaching 295 K, which may due to the non-optimized growth conditions for non-(100) surfaces. With suppressed non-radioactive recombination at 77 K, high-integrated PL intensity has been observed for all samples, which indicates comparable quantum efficiency for all substrates. Additionally, even better optical properties have been reported for samples on non-(100) surface compared with (100) surface [9, 21, 22]. The optimization of growth condition of high-index surface is under investigation for better device performance. Nevertheless, our results demonstrate the potential of using high-index GaAs surface for supperluminescent diodes applications. In conclusion, the morphology of In0.2Ga0.8As/GaAs grown on GaAs (100), (210), (311), and (731) substrates has been studied by AFM. Three-dimensional nanostructure has been observed for (210)- and (311)-oriented surfaced. Moreover, the optical properties of the samples have been investigated by PL measurement. Spectral broadening has been observed for sample grown on (210) surface. The results presented in this work suggest future potential of high-index surfaces for superluminescent diode applications. This work was supported by the Arkansas Biosciences Institute and the MRSEC Program of NSF Grant No. (DMR-0520550).